It's no secret, Jamaica is my home. I often tell people I was simply born in Canada. With Jamaican roots, I've always felt extremely connected to this beautiful island as it was the birth place of both my parents/extended family, and was my first overseas trip as a toddler. Extensively popular among nature enthusiasts, honeymooners, and adventure seekers alike, Jamaica's laid-back vibe combined with its unparalleled natural beauty attracts all types of travelers. Whether you’re looking for a relaxing beach escape or an adventurous getaway, the best way to enjoy Jamaica is by experiencing it like a local. This will give you the opportunity to truly soak in Jamaica's heritage, tradition, and culture. One of the best ways to experience a place like a local is to eat like a local. Being a very touristy destination, Jamaica is filled with top-class restaurants, hotels, and eateries, but once you get there you'll notice only foreigners eat there. So, to really enjoy local cuisine (which, by the way, is absolutely delicious) you'll need to delve into all its flavors and ingredients without fear. Let's first discuss Jerk! The jerky spice of Jamaican food will conquer your tastebuds with blends of scotch bonnet peppers, thyme, ginger and just a dash of something extra. The best way to experience jerk anything is to stop by a jerk bbq hut where you'll inevitably notice locals bbq'ing jerk chicken, pork, and fish on the side of the road as you drive the streets. If you're looking to dine in, my favourite restaurant for jerk anything is Murrays! And whatever you do, be sure to enjoy a Jamaican patty - which is a flaky pastry turnover filled with meat and spices (with vegetarian and pescatarian options available). The two famous rivals: Tastee and Juicy patties are among the most popular on the island - it's been an ongoing debate for decades which of the two taste better. But if you ask me, the best patty in Jamaica is found at the Devon House Bakery in Kingston! 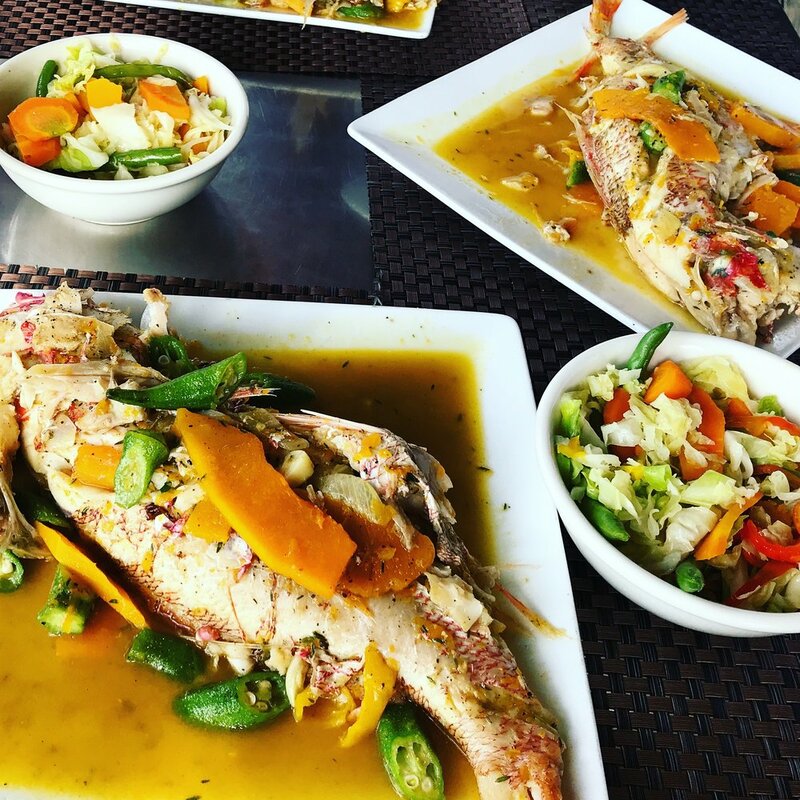 If you're staying coastal, be sure to visit one of the seafood restaurants off the beach to enjoy some escovitch fish straight from the ocean. My favourite restaurant for fresh fish in Jamaica is Little Ochie! Truthfully, the best way to eat like a local is to stop at a restaurant on the side of the road as you make your way to your destination. The local mom and pop restaurants have some of the best and tastiest dishes you'll find in Jamaica! If you decide to be adventurous and take my advice, here are some traditional dishes you MUST try if available: Ackee and saltfish (our national fruit and dish), breadfruit, bammy, fried dumpling or festival, callaloo, brown stew chicken, red pea soup, curry goat with white rice, and oxtail with rice and peas! Be sure to order some ginger beer to wash everything down! Or, if you're a drinker, opt for our local red stripe beer! For a snack, I highly recommend stopping at one of the fruit vendors on the side of the street to enjoy a fresh coconut, or a juicy mango. I've never had fruit anywhere else that tastes as fresh and amazing as the fruit in Jamaica! As you take your trip through Jamaica like a local, be sure to enjoy our other national 'musts' which include Sorrel Punch (especially if you visit around the holidays), hardo break with jamaican cheese, rum cake, and blue mountain coffee to name a few! Sure Jamaica is filled with stunning beaches and breathtaking landscapes that are truly worthy of visiting; however, once you get there you'll find yourself surrounded by too many tourists. So, head inland to find some of the island's most fantastic hidden treasures. An adventure that will take you out of the ordinary tourist path is going bamboo rafting on the Martha Brae River, a river surrounded by the mystery of the local “The Legend of Martha Brae”, true Jamaican culture served by a local. Another unique way to get soaked in local culture and tradition is to visit the Rose Hall Great House which is reported to be the home of White Witch, the coastal town of Falmouth, the Bob Marley Museum, and the Rastafari Indigenous Village. Another really unique experiences I’ve had to date in Jamaica was in Falmouth, Jamaica at the glistening lagoon. First, it’s not in a cave, but in open water. Apparently there are only 4 of this type in the world. And secondly, as you can see from the photo below, the illumination is unreal! And pictures do not even do this justice. I’ve done a few lagoons in my time (one in Japan, the other in Italy).... and none have compared to the amazing natural beauty of this! Its the brightest I’ve ever seen and It’s truly magical! At $25 USD it’s a little pricey (especially for only 20 minutes) but my God was it ever cool! Another favourite adventures in Jamaica highly recommended by locals and not very touristy is 19th-century colonial Devon´s House which comprises the mansion and grounds, historical exhibits, boutiques, and even an ice cream parlor to cool off (that has been ranked some as some of the best ice cream in the world). Finally, don´t miss out on the fantastic Dunns River Falls, where you might be among tourists, but the stunning landscape and the breathtaking falls make it all worth it. Wah gwaan – “What’s up” or “What’s going on”. Yes, there are plenty of private taxis, tour buses, and private shuttles, boats, and so on. But to truly know how real Jamaicans live, make sure to try the form of transportation that they use. The most common way of transportation around the island is to take route taxis/buses. You'll not only save a bunch of money, but you'll be shoulder to shoulder with local people who are friendly, helpful, and happy to chat while riding the bus. This method of moving around might be a bit crowded; however, despite untruthful rumors, it's safe, fast, and very much a fun time to be honest. One key point in living like a local is not to stay in one of the island´s numerous all-inclusive resorts, luxury hotels, and private resorts. To truly live among the locals try staying at a Guesthouse or a Villa. To find a place that fits all your needs perfectly don´t hesitate to visit AllTherooms.com and customize your search. I hope you've enjoyed my take on Jamaica and all it has to offer. If I could, I'd have written a novel for you! But for now, this should suffice. Enjoy my island, and if you visit in the near future, be sure to give it a big ol' hug for me!! !